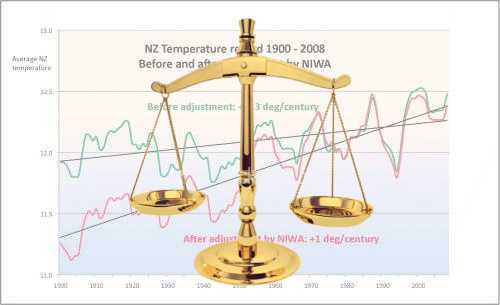 NIWA’s temperature adjustments to be weighed in the scales of justice. In an unprecedented move, the High Court at Auckland has been asked by the NZ Climate Science Coalition to invalidate NIWA’s official national temperatures. Papers filed last week by the NZ Climate Science Education Trust ask the High Court to invalidate the New Zealand official temperature record (NZTR) developed and promoted by the Crown Research Institute, NIWA. NIWA maintains temperature archives for the past century, and attempts to forecast temperatures for the next century. These records form the basis of NIWA’s scientific advice to central and local government on issues relating to climate change. All manner of documents published by NIWA claim that NZ’s temperature rose over the last hundred years by 0.9°C, supported by their specially-adjusted readings from their specially-selected weather stations. Around the world, temperature records have been coming under closer scrutiny as people have discovered quality problems and even outright dishonesty affecting their national temperature history. This, though, will be the first time anywhere that a national temperature dataset has been placed before a court of law for an impartial assessment. This is not an inquiry into man-made global warming, only the NZ temperature record. A: to set aside NIWA’s decisions to rely upon its Seven Station Series (7SS) and Eleven Station Series (11SS), and to find the current NZTR to be invalid. B: to prevent NIWA from using the current NZTR (or information originally derived from it) for the purpose of advice to any governmental authority or to the public. C: to require NIWA to produce a full and accurate NZTR. Many scientists believe that, although the earth has been in a natural warming phase for the past 150 years, it has not heated as much as Government scientists claim. The precise trend is extremely important, as it underpins the central contention that human activities are the dominant cause of the warming – if there was no warming to be shown, no cause would need to be found. The Statement of Claim alleges bias and unethical conduct on the part of NIWA’s National Climate Centre, based partly on NIWA allegedly delegating the NZTR decision to a former employee, James Salinger, knowing that he had a vested interest in an untested theory put forward in his own 1981 thesis. NIWA also knew that the data and calculations for that theory had been lost and thus could not be replicated. The Court will be asked to rule that NIWA has refused to repudiate the current NZTR in order to avoid political embarrassment and loss of public confidence in the objectivity of its scientists. The proceedings were filed and served last week and NIWA has up to a month to respond. Barry Brill OBE, 09-402-8012, 021-486-858, barry.brill@gmail.com. Bryan Leyland, 09-940-7047, 021-978-996, bryanleyland@mac.com. Richard Treadgold, 09-479-3396, 0275-340-641, richard@wordshine.co.nz. What is that graph I see lurking behind the scales of justice? Does this help clarify the alterations NIWA made to the Met Service records? It seems to me that anyone who changes any long-standing archives should explain their actions and their motives. How can somebody sitting in a NIWA office today know more than the meteorologist who compiled these records in the early 1900s? Perhaps there is some clever technique involved – and perhaps not – but why doesn’t NIWA publish its calculations and see whether others agree? That’s how science is supposed to work. I’ve just had a look at a couple of blogs by the running dogs of climate catastrophism – http://publicaddress.net/6803#post6803 and http://hot-topic.co.nz/nz-sceptics-lie-about-temp-records-try-to-smear-top-scientist. Much agitation and arm-waving, but nothing at all on the allegations set out in the summary Statement of Claim. Except, the truffle-snuffler goes out of his way to contend that any graphs on NIWA’s website are “unofficial” and that the historical base for advice to the NZ Govt doesn’t come from NIWA. An early indication that NIWA & co now intend to distance themselves from the Seven-station Series? After cuddling up to it continuously for the past decade? That sounds like good news for the outcome of the case. Yes, that’s right. The graph is the Coalition’s latest and best clarification of the difference between the raw (monthly) temperature readings and NIWA’s adjustments. I’ve provided a full-size version at Dynamite changes to raw readings. It’s easy to see that the earliest readings were lowered, resulting in a high rate of warming. Ninety per cent of the adjustments NIWA made went to increase the rate of warming. One would expect to see about 50% going each way, if the adjustments were made without prejudice, or randomly. Here’s Renowden’s rant from earlier today, notable for his reluctance to comment on our actual Statement of Claim and the obvious fact that most his commenters sense no obligation actually to read what we say. It does seem that Renowden is distancing NIWA from the 7SS; I’ll dig up some statements from Wratt and Smith that demonstrate their past reliance on it. They do clarify adjustments they made extensively and explain why using raw data is a dumb idea. See link. People are always quick to throw wild accusations. We all need to do a little thinking first! NIWA gives reasons for the adjustments (if that’s what you mean by clarify) only at the Hokitika station. They now list examples of adjustments on their web site, where before we asked our questions they did not mention they even made adjustments. So that’s an improvement. But we’re still waiting for descriptions (not merely the net numerical amount) of adjustments at the remaining six stations. We’ve been waiting six months since they said they would recreate the schedule of adjustments. Chris, only here will you learn that the NZ Climate Science Coalition always knew that adjustments were necessary, and why. Please remember that after seven months we’re still waiting for NIWA to answer our simple questions: what changes did you make and why did you make them? Once again, look at their website. They give 2 very good examples of the adjustments made to the Wellington and Auckland sites. They show the amount of adjustment and why. What more do you need? I don’t get it? They even give the raw data used and the amount of adjustment they made. I went through and plotted the raw data and it becomes apparent that the amount of adjustment that they use is not unreasonable. Yes, I’ve seen those pages. They seem to be good examples of adjustments. They satisfy most people. But I think everyone should pay very close attention, to understand why those examples don’t satisfy our questions. We asked NIWA two questions: What changes did you make? Why did you make them? NIWA have given us the numerical adjustments, but no clue as to why each adjustment was made. They (through Dr Mullan) have recreated the Hokitika adjustments, although they are not what Salinger did. They are yet to provide reasons for the remaining six stations, though they have said they would “recreate” them. We will never know the reasons for the original adjustments done by Salinger. If you were reviewing their adjustments, you would ask why they were made, wouldn’t you? You would be especially keen to see their justifications once you learned that the raw data contains no trend until the changes are made. Boy, you’d double-check those changes really well, I bet! They have offered examples since November, but we didn’t ask for examples, and that’s it in a nutshell. Ask yourself this: are the two examples shown on the pages you cite actually applied to the NZ temperature record (NZTR)? If you think they are, please locate the precise statement from NIWA that says so. In fact, there is nothing on those two pages that says those examples are actually applied to the NZTR. The language they use is nicely ambivalent, but, to be blunt, Chris, they are bluffing. If they were not, they would say clearly “these are the changes”. So you see it’s very simple, but because most people trust our public servants to do the right thing, they miss the fact that NIWA is using clever, ambiguous language and become frustrated, then they get angry at us. But we’re just asking the questions that we first put to NIWA last November. We will keep asking until we get answers, because we simply want to review the national temperature record. I have already downloaded the data they provide for the seven station series, and yes, they use the data from both those examples. You might try doing it yourself. Plot the data and compare it with what they have for Wellington and Auckland . You will find them to be identical! Thanks. I’ve asked for an expert opinion. Is that someone from NIWA? No. An independent peer review!